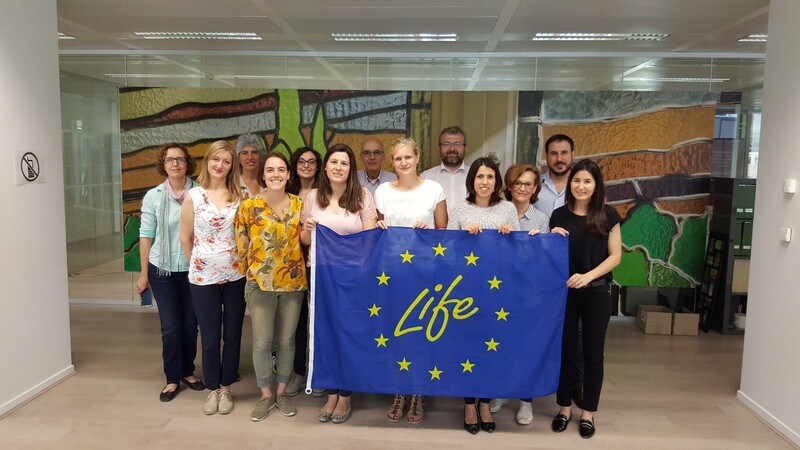 On Wednesday June 6th 2018, the LIFE-FLAREX consortium held its 3rd biannual project meeting in Brussels at the delegation of the Catalan Government in the EU. In this occasion, the project welcomed the project monitor from NEEMO, the external support service to the EASME for the LIFE programme. The meeting started with an introduction from NEEMO monitoring team presenting their role within the LIFE programme in assisting the European Commission on the assessment of the progress. Next, the LIFE-FLAREX partners presented the progress of the different actions that have been ongoing during this first year of the LIFE-FLAREX project including the preparatory actions which have been completed and their public deliverables are available on the project website. The team also engaged in fruitful discussions around the selection of textiles and flame retardants to be used during the project along with the planning of the work for the next months including the start of the toxicological trials which will be carried out by CSIC-IQAC and the Risk assessment and Life Cycle Assessment, both to be performed by LEITAT. Lastly, the meeting included a review of the different dissemination and communication activities that have been performed during this first year, highlighting the project presentations at three highly recognized conferences: ECOFRAM 2018, SETAC 2018 and the 3rd conference on “Fire-safe Textiles and Plastics” in October 2017 and ended with the review of the project management and financial administration.